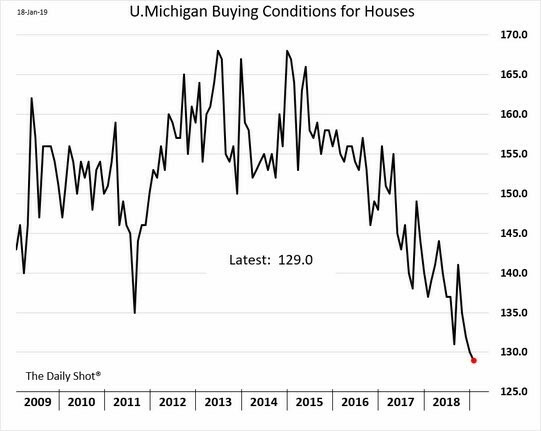 The decline in the University of Michigan consumer sentiment index because of political uncertainty caused by the government shutdown and trade war as well as the stock market volatility means it’s no surprise the buying conditions for houses and vehicles have fallen. The chart below shows the latest reading in the house buying conditions index. Because of strong wage growth, slowing housing price growth, and lower interest rates, the buying conditions should have improved. However, sentiment isn’t always driven by facts. This explains how the industrial production report was stronger than the soft data manufacturing surveys. The media is making the government shutdown and trade war appear as a bigger issue than it is to the recent economic deceleration. While these issues are not helping the economy, they are not the core reasons behind deceleration in rate of change terms. The stock market crash in late 2018 is in the rear-view mirror, which was pricing in an economic slowdown. 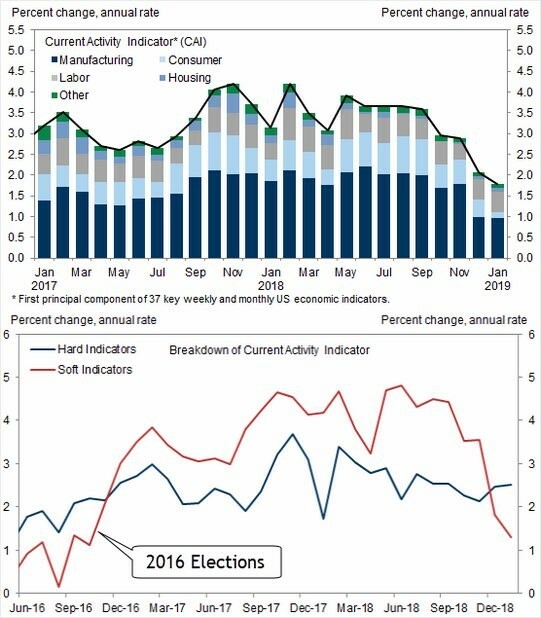 Furthermore, in rate of change terms, we are seeing economic deceleration in 2019 of which both the government shutdown and trade war are tiny components. If overall consumer sentiment falls sharply (from 98.3 to 90.7), consumers aren’t going to improve their interest in making a big purchase like a house or a car. However, the MBA mortgage applications index shows home purchase activity actually did improve in January. Unadjusted applications were up 13% year over year in the week of January 18th. 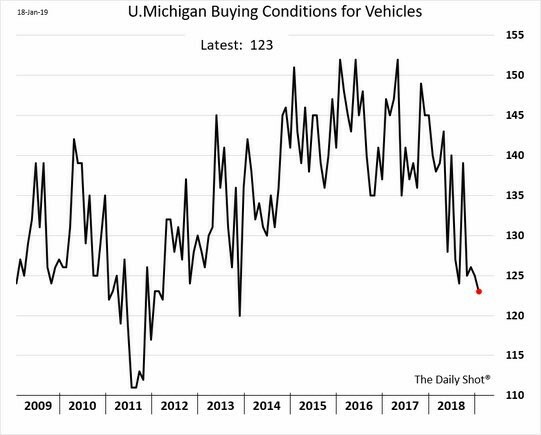 As the chart below shows, the vehicle buying conditions index fell to the lowest point since 2013. That’s different from the 4.7% jump in monthly vehicle production in December. To be clear, just because sentiment indexes can be manipulated doesn’t mean we should ignore them. The weakness in housing buying conditions in 2018 helped forecast the 10.3% decline in existing home sales in December. Soft data reports always come out before the hard data, so they give an earlier look at the economy. Because of the government shutdown, it could be a long while before we get the December retail sales report. That makes the consumer sentiment report more valuable. It’s possible weak consumer sentiment caused by political uncertainty and stock volatility causes spending growth to fall. We’d just trust it more if the sentiment decline was caused by higher joblessness and lower wage growth. In previous articles and in this one, we have discussed how soft economic data has been much weaker than hard data. In 2017, bearish investors loved to discuss how hard data was much weaker than soft data because it fit their narrative. Now that the roles have reversed, they like discussing the soft data more. The differences between the two remain the same no matter which biases reports appeal to. The soft data comes out earlier, and the hard data is what gets entered into GDP calculations. As the bottom chart below shows, the soft data has recently pushed below the hard data. 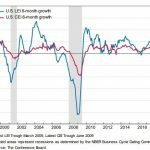 There were big sentiment swings in late 2016 and late 2018, but economic growth has been relatively consistent. The top chart shows the weakness in the current activity index which is driven by the soft data. Manufacturing and consumer data have been especially weak. As we have mentioned, there is less hard data to work with because of the government shutdown. Q4 earnings season hasn’t been good even though stocks have rallied sharply in the past few weeks. 69.5% of S&P 500 firms have beaten EPS estimates which is very strong. 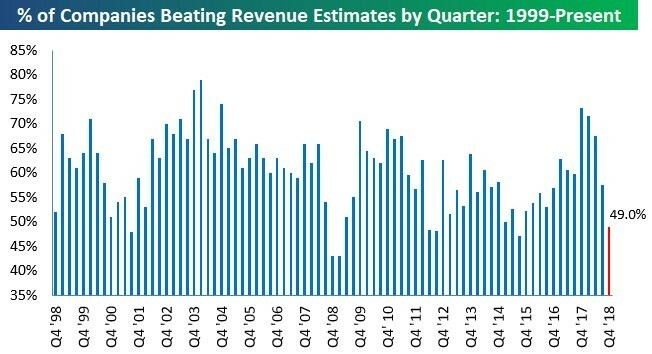 However, as the chart below shows, only 49% of firms have beaten sales estimates. Sales results are tougher to beat than EPS estimates which makes them closer to reality. Even during the disastrous 2008 financial crisis, more firms beat EPS estimates than missed them. Interestingly, the current sales beat rate isn’t much higher than the lows in 2008. That’s not to say growth is as weak, but it is disconcerting as analysts will need to lower future estimates. 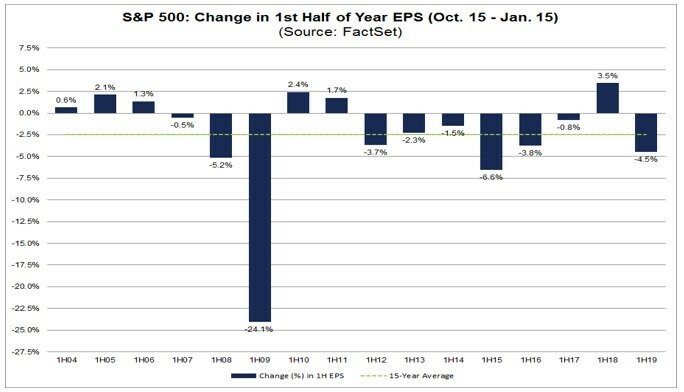 According to FactSet, Q4 S&P 500 blended EPS growth is 10.6% which is below estimates of 12.2% on December 31st. That’s with 11% of firms reporting as of January 18th. We have been seeing earnings estimates crater for the past few months. The issue is the declines have been picking up steam. The estimates started 2018 by increasing and slowly they have declined more each quarter. Up until recently, the declines were near the long term average. Now they are starting to exceed the average which is disconcerting. As you can see from the chart below, the change in the first half of 2019’s EPS estimates from October 15th to January 15th is -4.5%. That’s the worst decline in 4 years and the 2nd worst decline since 2009. In the past 15 years, the average decline is 2.4%. The fact that estimates are declining isn’t a problem. It’s that the decline is worse than average. The 3 worst sectors have been energy, technology, and materials as their estimates have fallen 29.7%, 7.2%, and 5.7%. The energy decline was caused by the 27.4% decline in oil. Those 3 sectors are in the top 4 of international exposure which supports the narrative that international growth is slowing. Healthcare and utilities were the only sectors with increasing estimates as they were up 0.2% and 1.8%. The chart below breaks down the estimate declines in each of the first 2 quarters in 2019. At the end of November, Q1 S&P 500 earnings were supposed to grow 5.9% and now they’re supposed to grow 1.7%. Q2 profits are expected to grow 3.6% which is down from 6.8% in the same time frame. 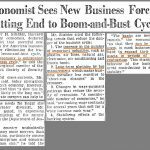 We may be on our way to an earnings recession. The Earnings Scout has Q1 estimates dropping from 7.94% to 3.73%. 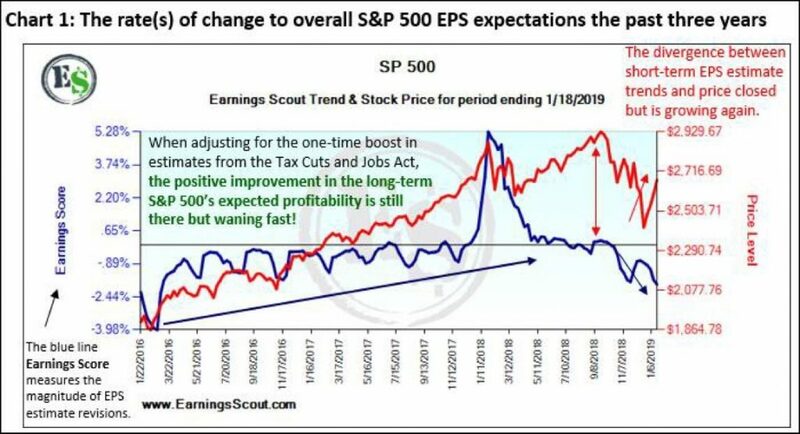 The chart below shows the trend in earnings estimates and stocks was in tune during the December correction, but now it’s out of tune as estimates continue to fall while stocks rally. If earnings fall in 2019, stock multiples will need to increase for stocks to have a positive year. The sentiment on buying conditions for houses and vehicles is probably too weak. 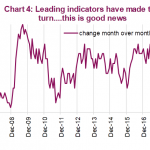 Overall sentiment has waned with particular soft data weakness from consumers and manufacturing firms. The good news is hard economic data hasn’t fallen. The bad news is earnings estimates for the first half of 2019 have cratered. By the time we get to Q1 earnings season, analysts might be expecting a decline. That doesn’t compute with the S&P 500 being up more than 5% year to date. 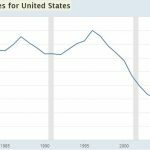 PreviousWill Housing & Economy Recover In 2019?